New Delhi: In an attempt to secure coal supplies for its fuel-starved power projects in India, state- run NTPC Ltd may spend an estimated $1 billion (Rs4,870 crore) to acquire a South African coal mining firm. While NTPC’s projects are facing an acute coal shortage, it has not succeeded in any of its overseas plans for sourcing either coal or gas. At the same time, the company has a sizeable war chest, with cash reserves of Rs44,393 crore. Going by recent coal deals, if the reserves are not proven, the valuation of a mine is around 10-20 cents per tonne. For proven resources, it is 50-60 cents per tonne. Operational mines come with a much higher price tag of around $2-3 per tonne. An NTPC executive confirmed the development and said, “We are examining this along with several other opportunities keeping in view our objective of long-term fuel security." India’s largest power generation utility’s strategy is to ensure a stable source for its energy, including coal and gas, needs as it will help cushion the impact of supply and pricing disruptions. This could result in NTPC competing with leading Chinese government-run coal miners such as China Shenhua Energy Co. Ltd and Yanzhou Coal Mining Co. Ltd, which are actively engaged in acquiring mining concessions overseas. Coal is critical for NTPC, as at least 80% of its installed capacity of 30,644MW is coal-based. With about 67% of the total power generation currently based on coal, the power sector is the largest consumer, absorbing nearly 78% of India’s total coal production. NTPC currently requires 122.94 million tonnes per annum (mtpa) of coal, and it expects this to grow further as a substantial portion of the capacity it is adding will be based on coal. The firm plans to add 22,430MW of capacity by 2012. 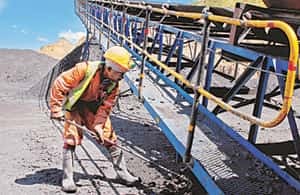 Analysts say coal mining costs are expected to rise, too, due to demand pressures on equipment and human resources in particular, but it will still have value for investors who choose to mine rather than purchase at prevailing market rates. “NTPC has been scouting for fuel supplies for a considerable period of time. They have not succeeded because playing an international resource game requires an international mindset and quick decision-making. Resources industry is a volatile industry and if one is unable to take rapid decisions, one will lose the opportunities," said Gokul Chaudhri, partner at consultancy firm BMR Advisors. India has 256 billion tonnes of coal reserves, of which around 455 mtpa is mined. It imports around 40 mt of coal. Demand is expected to reach around 2 billion tonnes a year by 2031-32, around five times the current rate of extraction, with most of it coming from the power sector.